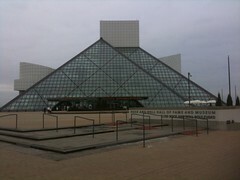 I will start with this premise: If you are reading this blog, you should visit the Rock and Roll Hall of Fame. I know what you are going to say. You are going to argue that [artist] isn’t in the Rock and Roll Hall of Fame yet, or that it took them [X] years to induct [X]. I have heard your arguments, and I have made them myself (Patti Smith likely only got in when she did because Michael Stipe issued an ultimatum. Gram Parsons is STILL not in. et cetera). But you need to separate the nominations from the physical place with the stuff, or you will be doing yourself a disservice. Because if you care enough to make those kind of nuanced arguments, then you are exactly the kind of person who needs to visit the Hall in Cleveland. I will get to individual artifacts in a minute. First, I want to talk about context. In a time in which the notion of radio as a cultural force is all but gone, and kids are learning about classic rock from Guitar Hero, context is vital. While it’s easier nowadays to connect the dots and find the music, I’m not sure that anyone bothers to do the legwork anymore. If you’re curious about a band, you’d probably read the wikipedia article and then go find the record for free. You wouldn’t have to find a record store that carried the Dutch import of the first New York Dolls album (nor deal with the humiliation you endured in the first store where you asked for it). You wouldn’t have to collect old Rolling Stone and Creem magazines to try to learn about bands. You wouldn’t troll through microfilm at the library on a rainy Saturday. But When you walk into the main floor of the RRHOF, it’s all about context. There’s a wall of early influences. Then there’s a wall of the 500 most influential songs in rock and roll. There’s the performer influence database, an entire wall. Then there’s an exhibit about censorship. Yes, I walked through all of those… and was greeted by Elvis Presley’s purple Lincoln Continental. The Elvis exhibit is the first one you should look at, because it’s a good example of the multi-layered presentation you’ll find in most of the RRHOF. For the average fan, you get the BOOM of the car and some of the more outrageous artifacts, while the rest of us can read the letter from Colonel Tom Parker to Elvis about paying his income taxes, how hard it is to become a millionare, and to not overspend. From there, I moved onto the ‘Treasures From the Vault’ exhibit, the one-offs. Like Cooperstown, only a small percentage of the items that the HOF has in its collection are on display at any given time. So this will be different every time you come. And there was Slash’s top hat and Ian Anderson’s fugly poncho but there was also the handwritten lyrics to “Clampdown” sitting next to “Here Comes A Regular”. There are handwritten lyrics EVERYWHERE in the RRHOF. You will be amazed how many rock stars opt for spiral notebooks and blue ballpoint pen. (Or maybe it was just me.) Joe Strummer used a black felt tip and the words were bouncing all over the page, Paul Westerberg used ballpoint and the words were neat and orderly. You know that bit that Joe shouts as the song fades out? It’s all there, scripted, in pencil. The clothing exhibit was next. Fleetwood Mac. Aerosmith. Bowie a little disappointing (and all of the items were from Mr. Bowie). The Who was fun. U2 and some lemon-studded quasi army uniforms they apparently only wore for the Australian tour (and I can see why). Nearby is a case with the first U2 tshirt (which Larry made when he was 15 – it looks like it could be sold in baby gap, it’s so small) and the lyrics to “Bad” (large A4 sheet of paper, ballpoint, lyrics against the left margin, changes in the right margin). Beatles & Stones followed. The big WOW in the Beatles exhibit is Lennon’s Sgt. Pepper suit. It is definitely a wow. But the rest of it was somewhat disappointing – at least to me. But I am a veteran of years of Beatlefest. Beatles memorabilia is old hat to me. With the Stones, the most interesting thing was a rider for MSG in 1973, on which the Stones’ preferred cheeses were detailed. (This will be hilarious to anyone who was ever on the Undercover mailing list). The rest of it was not so thrilling. I suspect Mick is hoarding it all for the big bang in the future. Personally, I am just not going to find Steel Wheels era memorabilia that exciting. I did like knowing that the Stones pinball machine was a gift from Keith and it used to sit in his apartment. I will confess to flitting through Hendrix – it’s not that interesting to me, and I did live in the same city as the <strike>Jimi Hendrix Museum</i> Experience Music Project . Even though I didn’t want to, I found myself going through the Jim Morrison memorabilia, prominently displayed with a plaque pointing out it came from his parents. As Ray Manzarek said years and years ago, kids, don’t die without a valid will, or your parents will control what happens with your legacy. Maybe I’m reading too much into it but there were too many letters from Jim’s father in the exhibit. (I did appreciate that the map of Pere Lachaise came from the collection of Patricia Lee Smith). My favorite part of the downstairs exhibit had to be the regional showcases: Rockin’ All Over The World. Memphis, LA, London 1960’s, London 1970’s, New York 1970’s. I looked at everything but cared the most about things like original telegrams from the artists who agreed to appear at Monterey. There is so much there and I didn’t need the exhibit to teach me anything, I just wanted to see what I wanted to see. Gram was there, in the form of an acoustic guitar that taunted me through the glass. As I mentioned in my blog post for the RRHOF’s blog, Tina Weymouth and Chris Franz were huge archivists and squirreled away posters and fliers and tshirts from the punk scene. I looked at every single thing in that case. The highlight of the punk exhibit was, of course, Joe Strummer’s guitar. I was talking to a docent later in the day and he mentioned that last summer, instead of Joe’s guitar, they had Paul’s bass from the Palladium gig, aka the cover of London Calling. That’s why you gotta come see this stuff. Really. You do. We did NOT do any of the movies besides the 63-minute reel that shows the inductees. I am sorry we wasted that hour because there was no actual footage from induction ceremonies (or just brief flashes). I expected a lot more. Even if you don’t see the movie, walk through the theater so you can see the signatures in glass of all (or most) inductees along the wall. The reason we didn’t sit through any other movies was because we didn’t want to see footage we either owned or knew by heart. We didn’t think they were going to tell us anything we didn’t know already. Maybe that was an incorrect assessment. That was about the time I wished the HOF had put together maps or self-guided tours for different levels of fans. I would have loved to have walked in there and gotten the “Fanatic” map that would have taken me through the things crazy people would love to see. They have what they call “Spotlight Artifacts” – the Sgt. Pepper suit is one of those – but how on earth is Joe Strummer’s guitar not a spotlight artifact? Or Janis Joplin’s custom car? When I left, my biggest impression is that I can not ever again skip exhibits about bands I care about. I am so, so sorry I missed the U2 exhibit, for example. It really is worth your time. You need a full weekend, or two full days. It’s 7 hours from NYC, with a couple of short stops. Drive Friday night, back on Sunday afternoon. You can do it in one day if you aren’t interested in the special exhibit, and don’t need to read every single word on every single lyric sheet that Bruce Springsteen gave to the RRHOF. But you’d still be missing something. There is nowhere nearby to eat in the middle of the day. We planned to eat at the cafe in the museum both days, just to save time, but the food the first day was so horrible that we preferred to have a large breakfast and wolf down a bag of pretzels and a drink instead the second day. The closest food was in our hotel, which was a 10 minute walk away, and then there was honestly nothing, because the neighborhood is a business district. (If there was food nearby, it would have been awesome if the HOF put together a guide – and maybe there was one.) I don’t know how I’d do it differently because there really are no other options. YOU CANNOT TAKE PHOTOGRAPHS, except in the lobby. No really. There is a sign that explains that due to the arrangements the museum has made with the artists who have donated the artifacts, photographs are not permitted. I wish that wasn’t true, but it is what it is. An excellent & much appreciated review, CLR. Thank you. But what I’d really like to know is the story of what record store, and what happened, when you were looking for the Dutch import of the first Dolls album! To the anonymous person who insulted me while trying to issue a correction – feel free to post your correction, but please back it up with facts and attribution, or you’ll continue to be deleted.